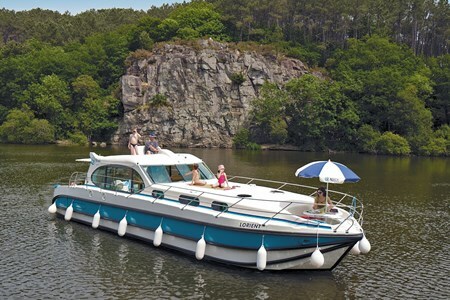 Get on the Nicols Sixto boat for a cruise along France's canals. It has 3 cabins and a nice living room. Families discount: -5% if 1 child Under 16 years old on board. -10% if 2 children (or more) Under 16 years old on board. For all length of cruises, all boats. Long cruise discount: - 10% discount on the second week and all subsequent weeks. Group discount: -5% for 2 boats. Combining discounts. : Discounts can be added together up to a maximum of 10% for short breaks or 15% for cruises of a week or more. Senior discount: 5% for one or more 65 years old person and more on board for all length of cruises, all boats. NB: each base owns one private car park and/or garage.